I wouldn't have even tried these a month ago. But since I'm on a 28 Day Challenge with MYSELF, I had no choice. I've been watching my FBS go up for a few months. And of course, it was following my weight. It was time to do something. So I chose to give Keto a try. According to the 2 Keto Dudes Podcast, these are OK. These take zero cooking skills really. If you can blend up some seeds and turn on the oven, you're halfway there. And they are really pretty quick too. You can knock out a batch of them in less than 10 minutes using the microwave. A bit longer if you use the oven. I used a counter top oven to make mine. Total cooking time was about 12 minutes. There are three basic ingredients. Flax seeds, herbs, and water. That's all you really need. I of course, needed a bit more. I wanted something other than water. So I used Olive Oil. Preheat the oven to 350º. Put the seeds in a blender. 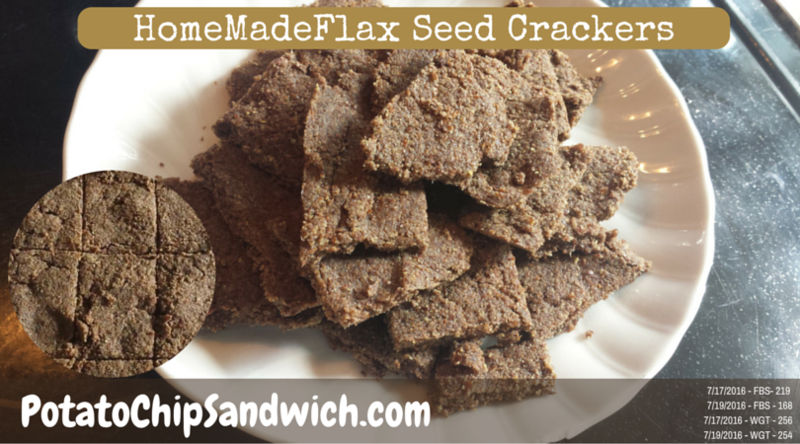 Turn it on high and blend them until the flax seeds are the consistency you prefer. What you are doing is 'milling' them into a 'flour'. So there really isn't a perfect consistency. Some like them chunky. Some like them powdery. Either one will work. If you prefer to skip this step, just buy 'linseed meal' at the grocery store. Put the meal in a bowl. Add whatever herbs you want. I used fresh basil and oregano from my garden. If you want salt, add that too. Now add water, or oil, until the meal sticks together. And I don't mean make a 'paste' of it. Just enough so that the stuff can be pressed into a pan and 'pre cut'. FYI, pre-cutting is only necessary if you prefer crackers. If you want to just break it up by hand once it's cooked, that's your choice. Bake until they are crispy. It took about 12 minutes for them to get the consistency I wanted. Nice crispy and tasty as any cracker I've ever had. These crackers are no different than any other food. The better they taste to YOU, the more you will like them. If you want to put garlic, onion, or any other herb in the mix, just do it. I'm sure you'll be glad you did. Let me know if you come up with some really cool experimental thing. Right now I'm thinking of making them with barbecue sauce instead of oil. I'll have to check out the carbs first though. According to some people, men can't tell time, can't follow directions and can't cook. That's simply not true. The owner and author of the site, me.. Stan Bush can cook. This site is simply a way for me to keep up with my recipes without putting it into my other 10 or so blogs. Everything is Google-ized, so it's connected to all my other stuff. This site gets it's name from road trips when I was in my 20's. By the time we would head home all we could afford was a loaf of bread and some potato chips.